Even as the Food and Drugs Administration (FDA) officials have begun testing the fish arriving into Goa from the neighbouring states for adulterants, challenging times lie ahead for the food safety officers deployed at the check posts. Highly placed officials at the Polem check post said that vehicles carrying fish from other states arrive at the state's borders between 1 am and 4 am. With nearly 50 to 60 vehicles reaching the check post, the challenge for the food safety officers is to conduct the spot tests of fish samples and clear the trucks that wait in a long queue. The officials are able to clear three vehicles in one hour with each test lasting for around 20 minutes. "We do not know as to how the FDA will cope up with the workload, as these are early days and we will have to see if the FDA works out a plan to cope with the workload as the days pass by," said Polem check post officials, who fear clashes due to the delay in release of the fish-carrying vehicles. 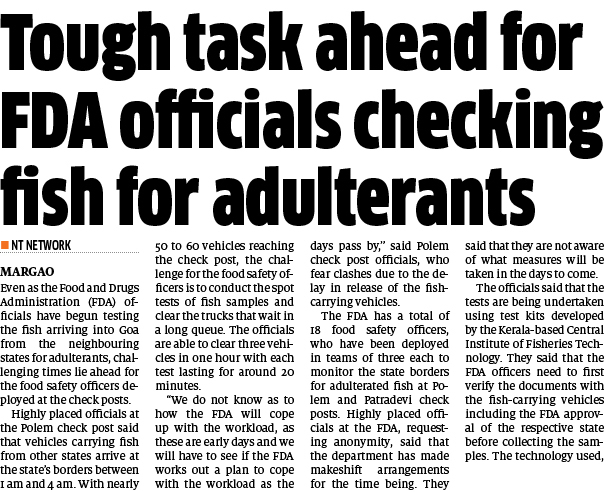 The FDA has a total of 18 food safety officers, who have been deployed in teams of three each to monitor the state borders for adulterated fish at Polem and Patradevi check posts. Highly placed officials at the FDA, requesting anonymity, said that the department has made makeshift arrangements for the time being. They said that they are not aware of what measures will be taken in the days to come. The officials said that the tests are being undertaken using test kits developed by the Kerala-based Central Institute of Fisheries Technology. They said that the FDA officers need to first verify the documents with the fish-carrying vehicles including the FDA approval of the respective state before collecting the samples. The technology used, however, cannot test shellfish and samples need to be sent to the FDA's central laboratory at Bambolim. The officials also said that if they come across a suspected case, the vehicle has to be detained and the fish destroyed and added that so far they have not come across such suspect cases.